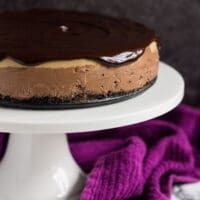 Layered Mocha Cheesecake – An Oreo crust topped with a deliciously creamy chocolate cheesecake layer, a coffee cheesecake layer, and dark chocolate ganache! 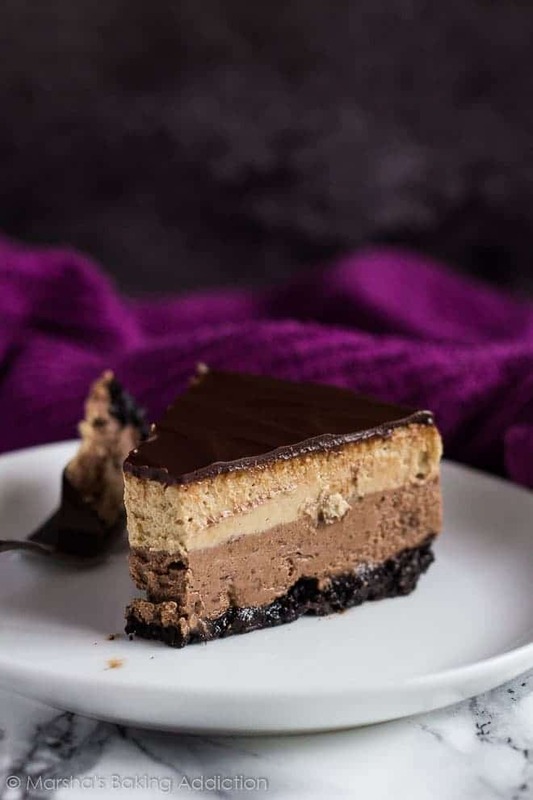 Today, I bring you the dream dessert of a cheesecake, chocolate, and coffee lover – Layered Mocha Cheesecake! The cheesecake bottom is a thick Oreo crust. Simply combine Oreo crumbs with a little melted butter, and press into the base of a springform pan. 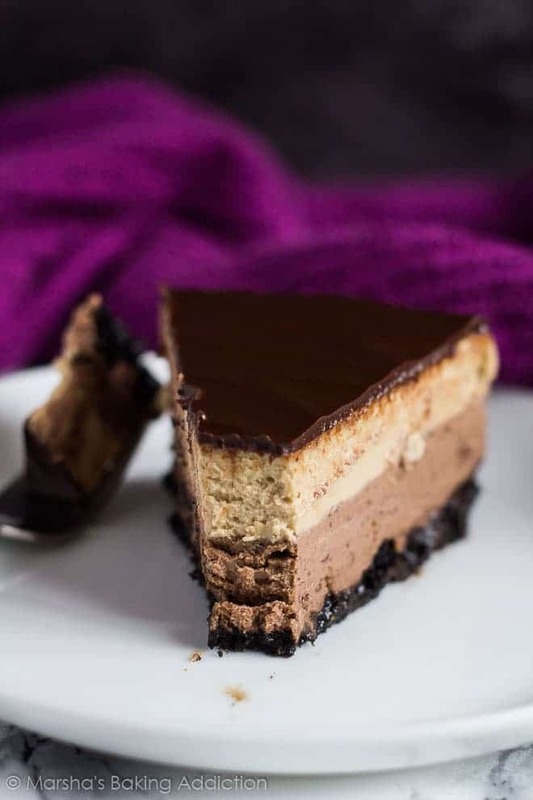 The second layer is a deliciously creamy chocolate cheesecake. 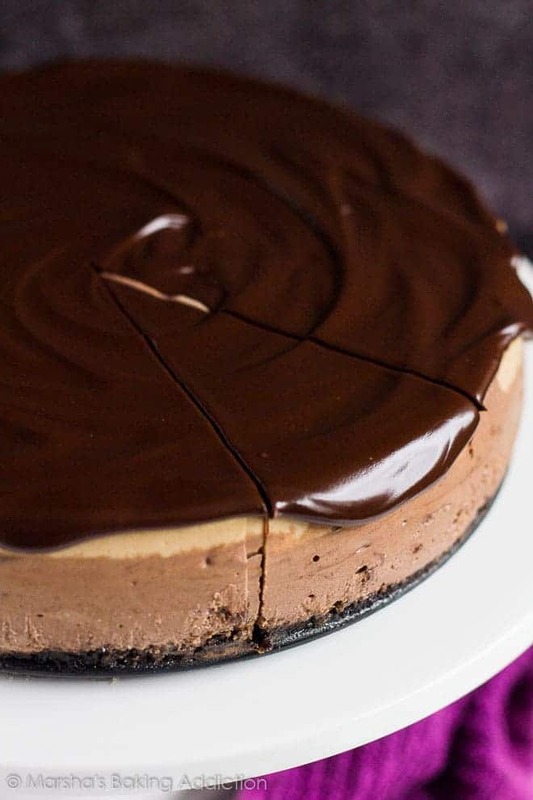 Melt 1 cup (175g) of dark chocolate and mix it into half of the cheesecake batter. Of course, you can use any chocolate you like here! 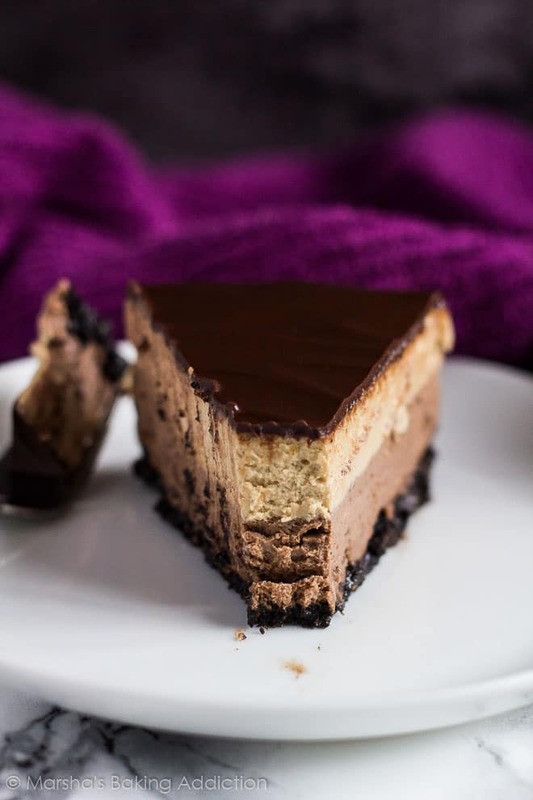 The third layer is an irresistible coffee cheesecake. Dissolve 2 tablespoons of instant coffee granules in 1 tablespoon of hot water, and mix it into the other half of the cheesecake batter. Now, let’s top them layers off with even more chocolate! 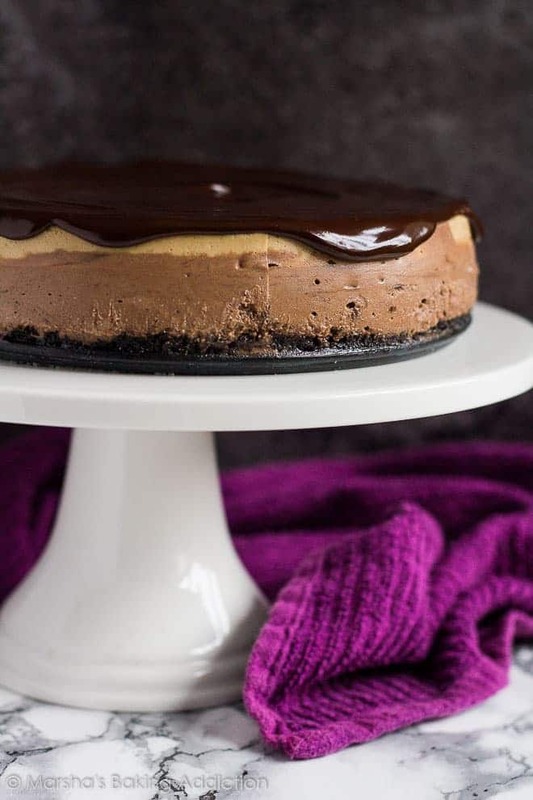 A simple ganache made by melting chocolate with a little butter, and spreading it on top of the cheesecake. Try these delicious cheesecakes next! 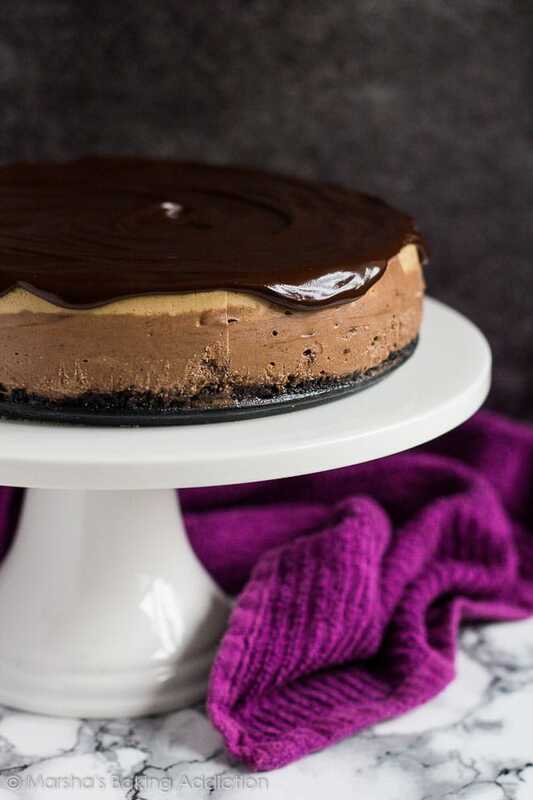 An Oreo crust topped with a deliciously creamy chocolate cheesecake layer, a coffee cheesecake layer, and dark chocolate ganache! Mix together the Oreo crumbs. and melted butter. Press the crumb mixture into the prepared pan, and bake for 8 - 10 minutes. Leave to cool completely on a wire rack. Cover the outsides of the pan with heavy duty aluminum foil (twice, just to be sure) to prepare it for a water bath. Using a handheld or stand mixer fitted with the paddle attachment, beat the cream cheese, sugar and flour until smooth and combined. Beat in the eggs and egg yolk, one at a time, then mix in the yoghurt. Divide the batter evenly between two bowls. Add the melted chocolate to one bowl, and stir until combined. Pour over the Oreo crust. Add the dissolved coffee to the other bowl and mix until combined. Spoon over the chocolate layer, and smooth out gently. Place the pan into a large roasting pan. Pour enough boiling hot water into the roasting pan to come 1-inch up the side of the cheesecake pan. Bake for 1 hour or until the centre is almost set and the edges are slightly puffed. Turn the oven off and leave the cheesecake inside for 30 minutes without opening the door. Open the door slightly and leave the cheesecake for another 30 minutes. 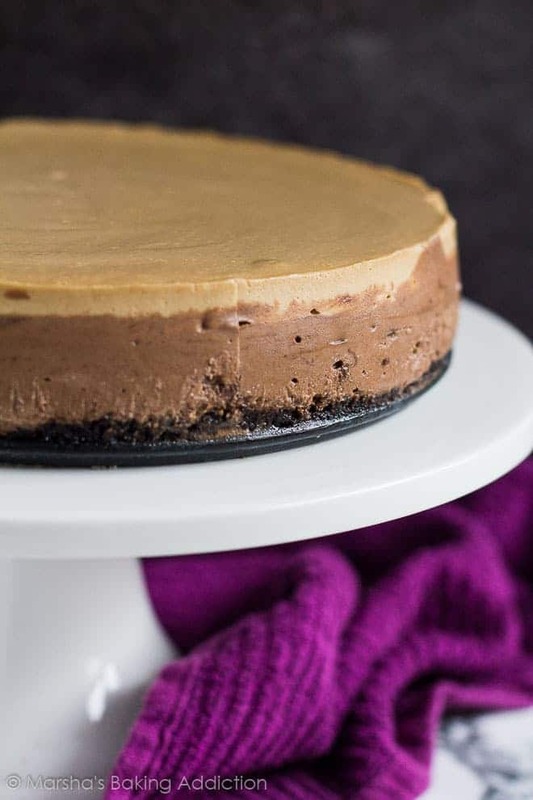 This cooling process helps the cheesecake to cool slowly to prevent cracks. Remove from the oven and leave for 15 minutes before removing from the water bath and foil. Chill in the fridge, uncovered, for at least 4 - 6 hours, preferably overnight. Microwave the chocolate and butter in 20 second intervals, stirring after each one, until melted and smooth. Spread over the cheesecake. 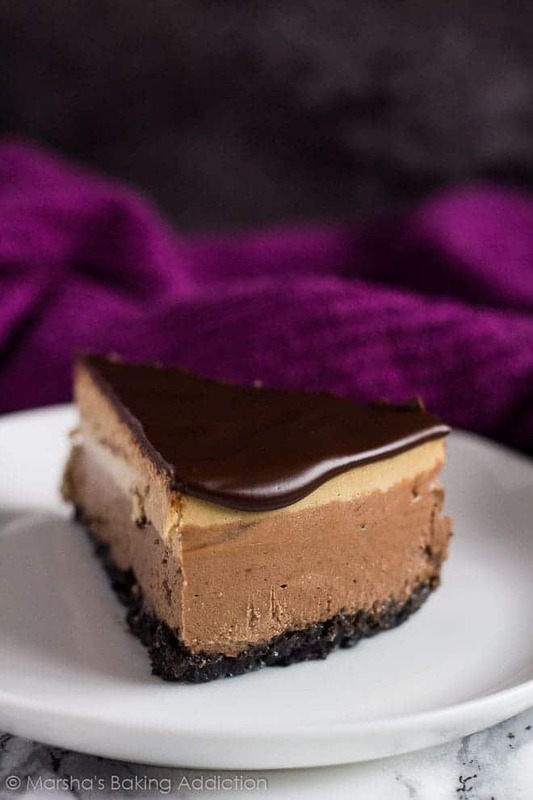 Your recipe seems like and chocolate lover’s dream! Beautiful. This looks heavenly! 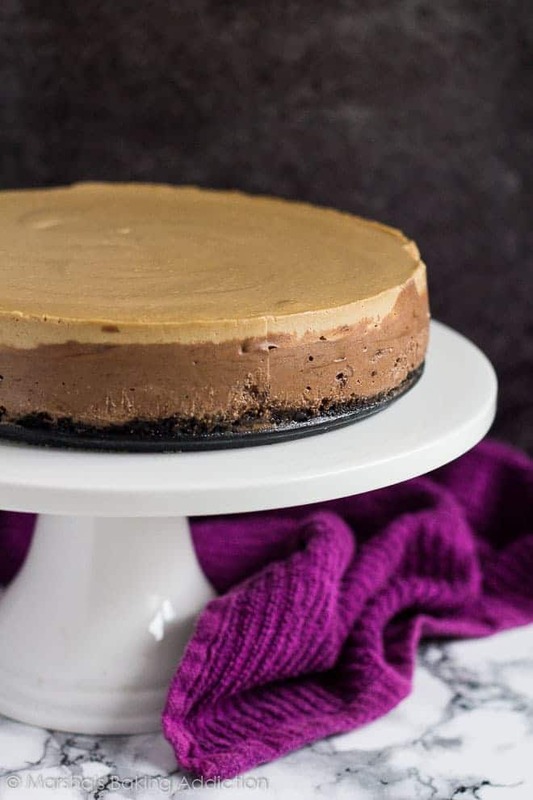 I make a pumpkin cheesecake with chocolate mousse topped with ganache which is very similar! You just can’t go wrong with mocha anything! YUM! You had me at the mention of an Oreo crust! The following layers just got better and better. Oh my word this looks amazing. Luscious. Decadent. Divine. So lovely! This looks so decadent and delicious. Love Cheesecakes!! This cake looks amazing!! I love cheesecake but never have made a layered one before! Its such a cool idea to use greek yoghurt too – I’ve never done that before either! I love these layers! And the ganache on top looks positively sinful! Wow, this cheesecake is gorgeous! I love the layers! Great idea. Great photos, too ! Thank you ! Cream cheese question: The recipe says “4 cups” (a volume measurement) and also “900 grams” (a weight measurement that is very close to 2 pounds). Can I use 4 8-ounce packages of cream cheese in USA? Yes 🙂 I’ve altered the recipe to solve confusion! 1-Is it possible to bake it in the oven directly without the water bath? 2- for the Oreo crumbs, do I use the whole cookie including the cream in between to make the crumb? I made this awesome cheesecake yesterday for my Moms birthday and happily she liked it. She even thought that it was much better than the ones we eat in the famous patisseries! I was so honored to hear those words from my mom and thank you so much for the recipe! If one thing I would like to add in my comment I would say that I had some cracks on my cheesecake but those were totally unnecessary because I was going to cover them up with the ganache and it was because I didn’t properly make my water bath thing so I will try it the next time that water bottle thing and I hope that I will finally have made the cheesecake of my dreams;) Greetings from Turkey!